J.K. Rowling | The Book Cafe! What could be better than pouring over 56 pages of fun,quirky Quidditch facts to follow up a quick read about the magical beasts in Potter’s world? Admit it now, all Potter fans must have always wanted to own this book since it was first mentioned in the Harry Potter books and Rowling provides all her devoted followers with just the chance(albeit at a high cost which can be forgiven since it contributes to charity like its companion book, ‘Fantastic Beasts and Where To Find Them’). So all you crazy, not so crazy, obsessed or normal Muggle witches and wizards, let me present, ‘Quidditch Through The Ages.’ Like its companion book, the proceeds from the purchase of this book go to the charity organization, Comic Relief, and like ‘Fantastic Beasts And Where To Find Them, ‘ this book too is simply fantastic and definitely worth all the money and good cause. ‘Quidditch Through The Ages‘ is a comprehensive history lesson of the noble wizarding sport, Quidditch. Everything about Quidditch that all HP readers have ever wondered about is answered in this slim volume. The book describes the emergence of broomsticks as a mode of magical transformation, the other wizarding sports, the development and evolution of Quidditch, the different Quidditch teams and the several racing brooms including Harry’s own Nimbus 1000 and Firebolt etc.. This vast treasure chest of Quidditch knowledge is supplemented by good illustrations as well. Despite the book having a factual basis, it is very much enjoyable thanks to Rowling’s great presentation and writing skills. The book at no point becomes a boring history lesson. Instead with each chapter, fascinating as well as interesting facts turn up that make one marvel at Rowling’s rich imagination. She thought up not only the intriguing, intricate plots of the seven books but also an equally enthralling history of the wizarding world’s favorite game. ‘Quidditch Through The Ages‘ is undoubtedly imbued by not only her remarkable imagination but also her quirky sense of humorous writing which also shrouds the way she has written about the development of this game. Some aspects( I would love to elaborate on them but that would spoil the fun for all future readers so I am refraining from it) mentioned in the book are bound to make you laugh and say LOL even if you normally don’t use this much abused SMS word. Just like the Beasts book was a copy of Harry own edition, ‘Quidditch Through The Ages‘ is a facsimile of the Hogwarts Library edition which according to Dumbledore’s Foreword was very difficult to part from Madam Pince. Thus, in order to add to the authenticity, the first page has the names of students who borrowed them and all keen HP readers will recognize all those students immediately. This teeny book broadens all Muggles’ perception of the Harry Potter world and proffers a lot of trivia about Quidditch(like its many rules and fouls) and other aspects mentioned in the septilogy(is this even an actual word?) but are never elaborated on and also draws on a lot from the personalities of various characters from the main series( Read the section ‘Praise for Quidditch Through the Ages and you will know what I am talking about!). 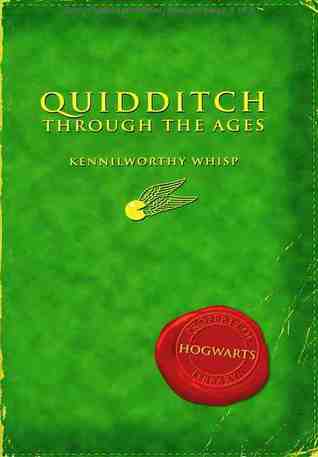 Although written by Kennilworthy Whisp in the wizarding world, ‘Quidditch Through The Ages’ has an overt Rowling style to it. ‘Quidditch Through The Ages‘ is funny, factual, fascinating, fabulous book that gives a systematic overview of ‘the most glorious of sports.’ Don’t go by its size. Good things can come in small packages and this package packs quite a powerful punch in its 56 pages! Worth it all the way! Just buy it! Haven’t all Potter fans always craved to know just a bit more about Harry’s world? I am sure we must have all wondered if there are more kinds of dragons other than the four mentioned in Goblet of Fire. Or are pixies really all that nasty as described in Chamber of Secrets? Or what exactly are grindylows and kappas? If these and more such questions pester your Potter obsessed brains every time you read the Potter books,then you will find, ‘Fantastic Beasts And Where To Find Them‘ an excellent guide to answer those very questions. 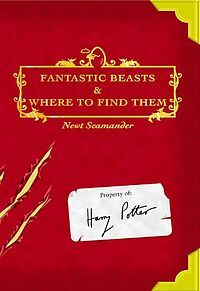 Written by J.K. Rowling for the charity organization, Comic Relief, ‘Fantastic Beasts And Where To Find Them’ is a wonderful companion to the 7 Potter books. The book is a treasure trove for all Potter fans. It gives wonderful, wholesome descriptions of all the numerous magical beasts which we either encounter in the books, or are mentioned in passing and all the other ones that are not but are an integral part of the Potter world. This book is an actual textbook for the subject ‘Care Of Magical Creatures’ in Hogwarts which is mentioned quite often in the book series. So it is actually written by Rowling but the author of that book in Potter’s world is Newt Scamander which is what we, the Muggles, are led to believe. Moreover, ‘Fantastic Beasts and Where To Find Them‘ is actually a reproduction of Harry’s own copy complete with torn covers and also the doodles and scribbles that it was subjected to by him and Ron and Hermione when it was in his possession. Both increase the authenticity that it belonged to Harry and make all Potter fans feel as if they are intimately part of Harry’s world once again. The latter are immensely funny when the reader is privy to their context and increases the fun of perusing this Potter companion. ‘Fantastic Beasts And Where To Find Them‘ throws light,in a dictionary style,on a myriad number of magical beasts, illustrating their characteristics, peculiarities, uses, habitat, dangers and much more. The book also illustrates Rowling’s witty imagination(not that we didn’t know of it already!). It is written in a (obviously) factual manner. This is balanced by the funny scribbles that it is peppered with which saves it from being completely drab and boring. It is an interesting volume with loads of information. Its like a study lesson in Harry’ world (the effect is expected as it is actually supposed to be a textbook). So all the information may not help you pass your Muggle exam but it sure will increase your knowledge of the wizarding world. An excellent book, a must read for all Potter fans who are sure to find something to laugh about along with many nuggets of information. Go, buy it and help in a good cause at the same time. Yup you guessed it! The title says it all, doesn’t it? What else could I be pottering around for except for Harry Potter??? Well not exactly among the 7 Rowling books but among the Potter fan fiction. And it is quite fun to read all these stories to pass you time. Most of what I read were short stories but I came across this novel on Goodreads website by Norman Lippert titled, ‘James Potter and The Hall of Elders’ Crossing.’ At first I thought its about Harry’s dad, James but no, its about his son, James’ first year in Hogwarts. The author obviously makes no money out of this but he himself has written a book called, ‘The Flyover Country’ and has also written books of James’ 2nd and 3rd years at Hogwarts, although I haven’t read them as yet. The plot concerns James going into the first year of Hogwarts. Initially he is nervous, in general because it is his first year and in particular that he is great Harry Potter’s son and has to live up to that legend. Eventually he does make friends and relaxes a little. The novel touches upon other students as well and the mischief they do. But of course, being Harry’s son, adventure can’t be far behind right? This year at Hogwarts representatives from Alma Aleron and United States Department of Magical Administration are to arrive at Hogwarts. Also, a movement called the ‘Progressive Element’ is spreading among the students that questions the recent history of the whole Battle with Voldemort and the fact that the existence of the magical community has to be kept a secret from the Muggle world. James and his two friends, Ralph and Zane, an American whose father works in England, discover a sinister plot to bring back the most dangerous wizard, Merlin, to this time. And these three are determined and confident to foil this plan. Well, the book is more exciting than it sounds here. It really is. Being a Harry Potter fan, it was good to read this particular book. ‘James Potter and The Hall of Elders‘ Crossing‘ is definitely not fantastic yet it gives a plausible imaginative story about Harry’s first kid. Reading the novel will stimulate any Potter fan as it takes the reader back to the school, gives tidbits of Harry and gang’s future and everything. Its quite fun to plunge back into that world again and is definitely enjoyable. So ok, Lippert is not a Rowling but his writing is decent, simple and comprehensible and retains the magic of the Potter world. The dash of the American element is well blended in in the book. Certain other imaginative bits like Snape’s portrait and Diggory’s ghost add a touch of nostalgia. 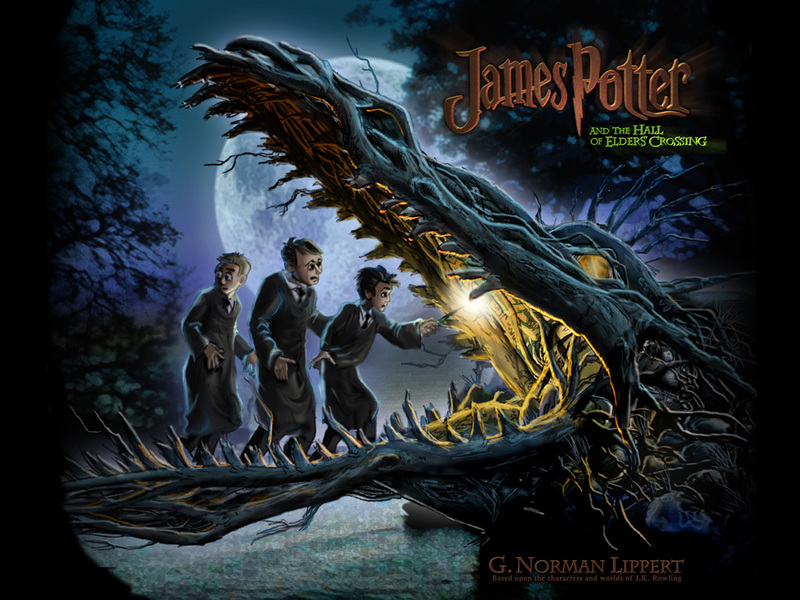 The friendship between different houses, James need to become like his father and the slight sketches of the old characters like Harry in the role of the Head of Auror Department, Neville as the Herbology professor and several such more elements show Lippert’s desire to be different while still capturing the charm of the Harry Potter books. In fact, all sort of fan fiction does require neccesarily to hold on to the original books to make a connection with the reader. I remember feeling very happy seeing all the old characters in a new avatar. However,there were some odd discrepancies which haven’t been explained such as James having subjects like Muggle Studies in his first year itself(which in Rowling’s case is supposed to be studied in the third year) or that different year students are attending the same lecture or that Harry gifting James’ best friend the Potions book that belonged to Snape(Harry couldn’t have got the book back because he left it in the room of requirement and also the things in that room burnt down because of the Fiendfyre set by Crabbe in the 7th book) etc. The whole idea of magic as a science wasn’t too appealing either but those classes of Technomancy were good nonetheless. It just showed(along with the American flavour) that Lippert has the capability to imagine quirky bits while mingling the original ideas from JK Rowling. In all, its worth a read for sure. Its good to be back in Potter world and ‘James Potter and the Hall of Elders’ Crossing‘ just helps you take the plunge into it! Go for it! 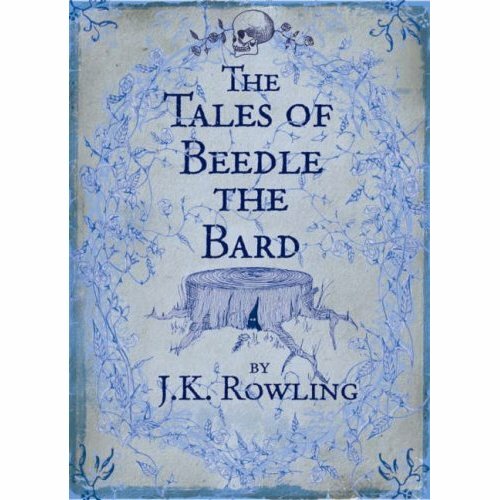 ‘The Tales Of Beedle The Bard’ by J.K Rowling is a short novel of 105 pages. It has 5 tales of fantasy that make for an interesting read and a great companion to Harry Potter series. The tales in the book are similar in terms of structure to the Aesop’s fables and Jataka tales i.e. as well as being entertaining and childish, they also give a message. In other words, they are didactic. After each tale, a note by Albus Dumbledore, the former headmaster of Hogwarts school, is written which furthers our understanding of the tale. It provides a unique glimpse into Harry Potter’s world and its history. The tales are excellent anecdotes that prove once again J.K. Rowling’s imagination is superior and simply marvellous. Her ability to weave a tale and connect it with the main Harry Potter series is incomparable. ‘The Tales of Beedle The Bard’ is a fast read, a book that can be read in an hour or so. Its a bit expensive for a book so thin but considering that the royalties will go to charity, Children’s High Level Group(CHLG), it seems justified to buy the book. When one reads ‘The Tales of Beedle The Bard’, one feels like one is reading in Hogwarts library and has come upon a quaint treasure of tales of olden times. Its a definite must rad for all Harry Potter fans who are curious to know more about Harry’s magic world, that goes beyond the seven books. It is a great collection to owe, a real prize.